Help! My Dentures Broke. What Can I Do? When you suffer from tooth loss, you rely on your dentures to make your life easier. Without them, you could not eat your favorite foods, speak clearly, or feel confident throughout the day. Unfortunately, there may come a time when your denture unexpectedly breaks. Nothing ruins your day faster than a broken smile. When this occurs, you may not be too sure what to do. You cannot go through the day without your teeth, but you know that you should not use them until after they have been repaired. When the unexpected occurs, there are several things you can do to make the situation a little less stressful. 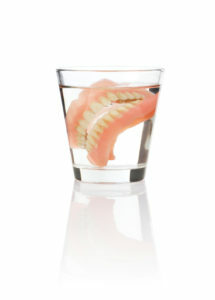 If your denture breaks, the first thing you need to do is remove them and dry them off to evaluate the damage. Assess the situation to determine the extent of the repair that will be needed, such as if a tooth came loose, they broke in half, or there is a piece missing from the acrylic base. Depending on the extent of the damage, you can determine if you just need a simple repair or if a new prosthetic will be needed. To help protect them from breaking, always handle them carefully when cleaning or removing them. It is best to place a towel on the counter to add a layer of protection in case you accidently drop them. There are plenty of do-it-yourself videos online that show you how to repair your dentures at home. Although they may seem like the quick and easy fix, it could end up causing more significant damage. While many claim that you can use over-the-counter repair kits or even super glue to fix the issue, it is best to leave it to the professionals. Although it can be hard to live without your replacement teeth, it is best to stop using them until after they have been repaired. Using a damaged dental prosthetic can be dangerous to your oral health. It can lead to sores and cuts of the soft tissue, which increases your risk for an infection. If your denture needs repair, it is best to call your dentist right away. In some cases, it can be considered a dental emergency, so your dentist will be willing to see you quickly, so you can get back to chewing and speaking with ease. Your dentist will evaluate the damage to determine if only a repair is needed or if you will require new dentures to be made. No matter your situation, they will find a solution to help you during this difficult time. Dr. James Olsen received his DDS degree from the University of Michigan School of Dentistry in 1988. In addition, he has completed several hours of continuing education, including at the prestegious Las Vegas Institute for Advanced Dental Studies. If you need to replace your missing teeth or if a dental prosthetic has become damaged, contact our office today to schedule a consultation with Dr. Olsen. He will help you regain a beautiful smile. Comments Off on Help! My Dentures Broke. What Can I Do?